Fast Track Alerts does what you would do if you had time to scrutinise your data, every minute of every day. Fast Track Alerts is an Email Notification Agent. You tell it what you want to look out for, and when what you're looking for happens, Fast Track Alerts notifies the people you choose to contact, by email. There are many alert permutations that will save your organisation time and money: your database holds key information relating to many business activities, departments and people. This information also relates to external service providers and other third parties. Clearly measurable Business Benefits can be derived from the influence of Fast Track Alerts, such as better SLA compliance and late penalty reduction, speedy notification of escalated circumstances, and using less space for more meetings. To find out more, see further information below, click the PDF button on this page, or Request a Demonstration. This alert is concerned with Room Booking No-Shows, and how not all unwanted bookings are cancelled by bookers. Alerts such as "Room Booking in 7 Days Reminder" and "Room Booking Tomorrow Reminder" send a reminder email to everyone with a room booking, 7 days before their booking and the day before their booking takes place. The Business Benefit of the "Room Booking Tomorrow Reminder" is that the number of No-Shows will be reduced, leading to a greater realised availability, increased room utilisation rates, and the associated cost savings. As the Room Utilisation Rate goes up, less space is needed to accommodate more staff. With fairly conservative costings, rationalising total space by one medium-sized conference room can save £70,000 a year. You tell Fast Track Alerts the circumstances that trigger the alert. You tell it what you want the email to say. You tell it who you want the email to be sent to. You tell it how often you want the emails to be sent. 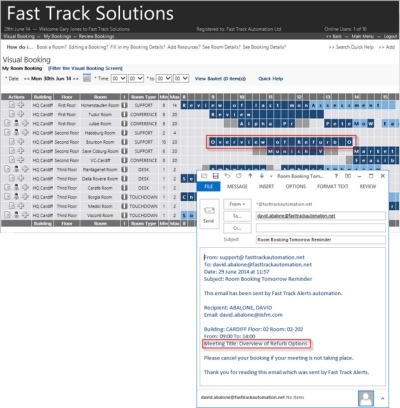 Fast Track Alerts will send many emails if there are many bookings the next day. If there is one room booking the next day, or hundreds, Fast Track Alerts makes sure that all sponsors are reminded. In virtually all room booking situations, when sponsors are reminded of their obligation to cancel unwanted bookings, the No-Show rate reduces. Whenever an event is triggered, because reminders need to be sent, a log is recorded. A log is also kept for each email that is sent, providing an audit trail inside the software (additional to logging on the server). The logs can be combined with room booking cancellation data to determine No-Show improvements, and to ascertain whether there are users who ignore the cancellation requirements and reminders. Clear benefits can be derived from informing service providers in real time about the jobs which concern them. Depending on the responsiveness of the arrangement with the service provider(s), different alerts can be configured and can also be combined. Service Providers are notified of new jobs until they are acknowledged. Fast Track Alerts looks for jobs which have been issued, not yet responded to, and automatically emails the service provider with a reminder that there are jobs that require their attention. In high priority situations, such reminders can be sent every 5 minutes. Perhaps once a day, each service provider receives an email which reminds them of the number of incomplete jobs for which they are responsible. The software can be deployed in both Windows Desktop and Service versions. The Windows Desktop version is used for configuration, and to fine-tune and review the alerts in an intuitive manner. Configuration of Alert Events includes setting up the flexible content of the reminder emails. The Service version, as is typical of services, is invisible. Typically Fast Track Alerts is set up and tested in Windows Desktop mode, and then switched to Service mode when the alerts are running applicably (in service mode, the routine mechanisms are non-visual).